(CLOCKWISE) 1ST QUARTER – Neap Tides. Lower high tides and higher low tides. NEW MOON – Higher high tides and lower low tides. 3RD QUARTER – Neap Tides. Lower high tides and higher low tides. FULL MOON – Higher high tides and lower low tides. If you live on the waterfront or fish the bays or surf often you have experienced the ebb and flow of tides. For many they remain a mystery as they know little about them. While most everyone knows that tides consist of movement of water and that there are high and low tides, many people feel that they are horizontal movements of water. Likely this comes from observing the incoming and outgoing tides along the beach. Actually tides are vertical movements of water and are controlled by gravity and highly influenced by the sun and the position and size of the moon. Tides are the result of small differences in the combined gravitational pull of the moon and sun at different places on the earth due to differences in distance from a particular spot on the earth. Both the sun and moon cause tides. The moon is the major force behind tides; however, the sun has an effect that is about one-half that of the moon. Another misconception about tides involves the term spring tides. Anglers often refer to spring tides as high tides generated around the Spring Equinox. The season has nothing to do with the term spring tide. When the moon is on the same side of the earth as the sun it is called a New Moon and on the opposite side it creates a Full Moon. In both cases their tidal effects combine and we experience higher high tides and lower low tides. The term spring as used here means “to rise up”. 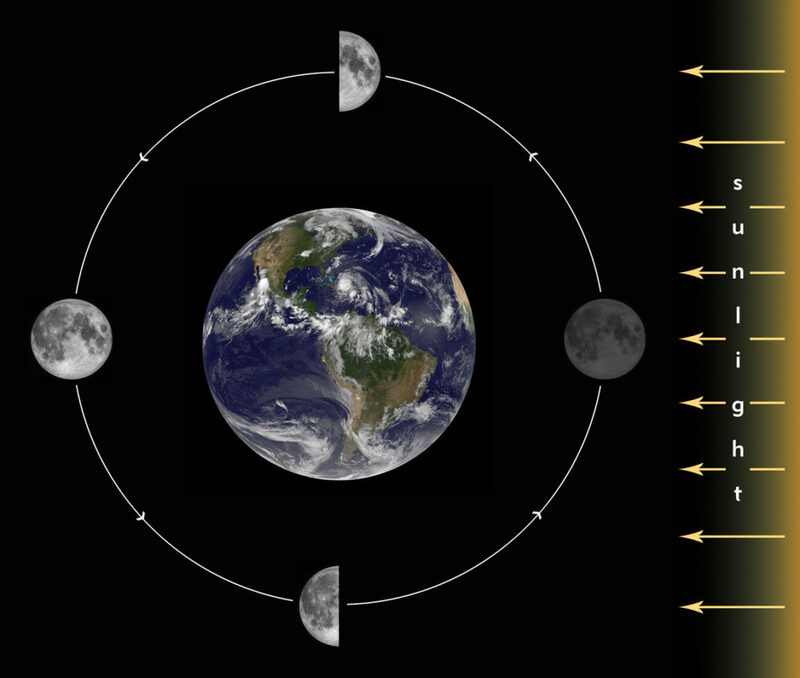 On the other hand when the moon is 90 degrees from the sun (Half-Moon) the tidal effects tend to cancel and we get lower high tides and higher low tides. This is called a Neap Tide. There is so much more that is written about tides, it is difficult to condense the facts in an article like this. For purposes of this article I will limit the effects to the Galveston Bay Complex. The Texas Gulf Coast experiences relatively small changes in tide heights as compared to points much farther from the Equator. Around New England and farther north, a tidal difference of 25 feet is common. In our area, we rarely experience much more than a four foot difference between the high and low tide. Using Galveston as an example, it is a barrier island with relatively small openings into the bays. This restricts the flow of water into the bays and as a result points along Galveston Bay never reach a full high or low tide and are about half the height of those along the beach front. Now, what about the effects on fishing? Tidal movement is a key factor in catching fish. Tides flush out crustaceans and small fin fish from the marshes and back bays and fish know that and are in a feeding mode when the tide starts moving. Along the beachfront an incoming tide is best for fishing as the rising water covers new territory where small crabs and other marine life have been hiding and allows larger predator fish access to the area. This is also true for the Gulf side of both the Galveston and Bolivar Jetties. While both incoming and outgoing tides are good for bay fishing, most anglers find the outgoing tide to be the preferred one for fishing. Along the upper Texas Coast there are other factors that influence tides from reaching their normal highs and lows. A strong southwest wind impairs the flow of water to and from the bays and generally results in lower than normal tide levels. A strong north wind and the accompanying high pressure following a cold front will push water out of the bays and keep tide levels much lower than normal. On the other hand, an easterly wind pushes Gulf waters into the bays and creates higher than normal tide levels. Both scenarios generally are not favorable for fishing. During periods of extreme low tides, boaters need to be extra cautious as a drop of two to three feet in bay water can expose the shafts of motors to dangerous obstacles normally far enough below the surface to not cause problems. the diagram seems wrong, the sunlit side of the moon at the bottom is on the wrong side?